Australia is expelling two Russian diplomats in solidarity with the global response to the poisoning of ex-spy Sergei Skripal in the UK earlier this month. The attack was the first offensive use of nerve agent in Europe since World War II. The decision follows more than a dozen other nations expelling Russian officials. Australia said on Tuesday it would expel two Russian diplomats in response to the poisoning of ex-spy Sergei Skripal with a nerve agent in the UK earlier this month. “The brazen and criminal attack was an attack on all of us,” Turnbull added. 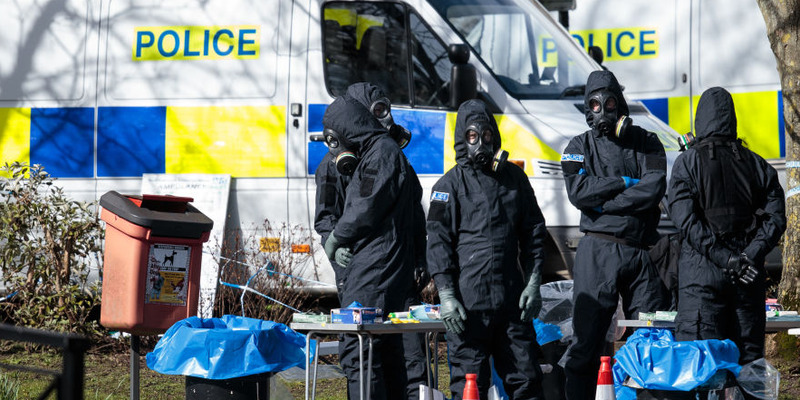 The UK attack, which targeted Skripal at a busy shopping center, was the first offensive use of nerve agent in Europe since World War II. Foreign Affairs minister Julie Bishop told reporters she expects Russia will expel a “commensurate” number of Australian diplomats in response, and that Australia is preparing for that situation to unfold at its Moscow Embassy. Turnbull also touted a “long range” of further actions that could be taken in response to Russia’s actions, including further sanctions and Australia’s attendance at the World Cup in Russia. The last time Australia expelled diplomats was in 2012, when Syria’s highest ranking diplomat was ejected in response to atrocities committed by the government in Syria. Jack Taylor/Getty ImagesPolice officers in protective suits and masks work near the scene where former double-agent Sergei Skripal and his daughter, Yulia were discovered after being attacked with a nerve-agent on March 16, 2018 in Salisbury, England. The decision follows several other nations expelling Russian officials in response to the attack. Last week, the UK expelled 23 Russian diplomats and their families to Moscow, citing national security concerns. UK Prime Minister Theresa May claimed that those discharged were spies working under diplomatic cover. The US followed suit with the expulsion of 60 Russian diplomats from the US-based Russian Embassy and permanent mission to the UN. The Wall Street Journal reported Monday the US also plans to close the Russian consulate in Seattle, which is located near a US naval facility. More than a dozen other countries have joined calls to eject Russian officials. European Council President Donald Tusk said Russian diplomats were expelled from 14 European Union countries on Monday. “Additional measures, including further sanctions within the common EU framework, cannot be excluded in the coming days and weeks,” Tusk told reporters. Australia has had strong sanctions in place against Russia since March 2014, in response to Russia’s hostile annexation of Crimea. Expanded autonomous sanctions in relation to Russia, Crimea and Sevastopol were announced in September 2014. In its statement, the Prime Minister’s office also raised the issue of “bringing to justice” those responsible for MH17, the plane that was downed while flying over eastern Ukraine in 2014.